We spend most of our waking lives at work—in occupations most often chosen by our inexperienced younger selves. And yet we rarely ask ourselves how we got there or what our jobs mean to us. The Pleasures and Sorrows of Work is an exploration of the joys and perils of the modern workplace, beautifully exploring what other people wake up to do each day—and night—to make our frenzied world function. 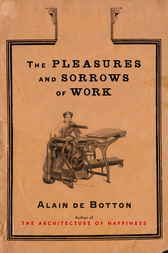 With a philosophical eye and his signature combination of wit and wisdom, Alain de Botton leads us on a journey around an eclectic range of occupations, from rocket scientist to biscuit manufacturer, from accountant to artist—in search of what makes jobs either soul-destroying or fulfilling. ALAIN DE BOTTON is the author of three works of fiction and six works of nonfiction, including How Proust Can Change Your Life, The Consolations of Philosophy, and The Art of Travel. He lives in London, where he founded The School of Life.